From 9 to 11 October 2018, the Joint Air Power Competence Centre (JAPCC) held its Annual Air and Space Power Conference in Essen, Germany. The conference was attended by more than 280 participants, including four NATO Air Chiefs and 55 General Officers, Flag Officers and senior civilian executives. Attendees also included members of several NATO organizations, representatives of non-governmental organizations, academia and defence industrial partners. In total, 25 different nations were represented, a true cross-section of the Alliance and European partners which fostered meaningful and fruitful discussion. The format comprised four panels designed to address the ­following issues: defining the threat environment, Air Power’s role in that environment, whether NATO has the right mindset to operate in this environment and how NATO can use Air Power to address these challenges. 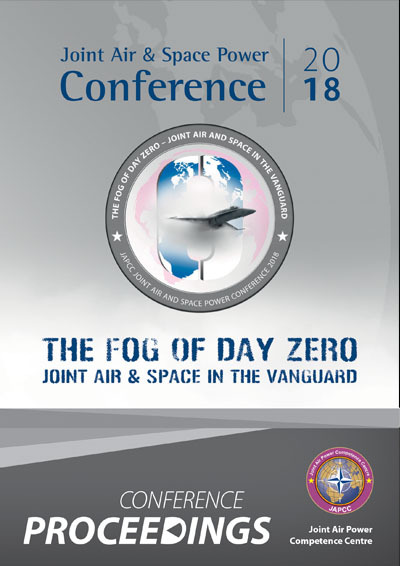 The theme of this conference was ‘The Fog of Day Zero’, a concept to describe the uncertainty of the environment and / or an adversary’s activity, experienced prior to the start of hostilities or the declaration of war. This uncertainty is often a result of modern adversaries, be they state actors, non-state actors or Violent Extremist Organizations (VEOs), committing hostile actions which remain largely below the traditional ‘armed attack’ threshold of war and may not be easily recognizable as such by the victim. In fact, modern warfare is not necessarily characterized by a definitive declaration of war, rather it may emerge through a succession of seemingly uncorrelated events. For this reason, the expression ‘Day Zero’ does not refer to a specific point in time or a specific length of time, rather it describes a situation of uncertainty about whether there is an attack underway, the identity of the attacker, their intentions and whether the hostile actions constitute an act of war. After the Cold War NATO was engaged in various campaigns, and confronted adversaries who lacked the capabilities to challenge NATO Air Power. This led to a period of complacency where many in the Alliance took for granted that NATO Air Power would always prevail and do so without significant losses. This complacency, combined with a global economic crisis, led to significant reductions in NATO forces, equipment and capabilities. Misplaced self-assuredness and a sense of superiority, continues to be the reason that, during exercises, Alliance forces are always assumed to be superior, suffer few losses and always win. In recent years, however, NATO has witnessed the re-emergence of near-peer competitors. Although these competitors would not be in a position to win a full-scale military conflict with NATO at this time, they have the means to attack NATO’s vulnerabilities indirectly, such as by employing cyber, strategic communication, electronic warfare (EW) and space capabilities. NATO’s military, as well as civilian population, is highly dependent on many of these systems and domains for communication, precision navigation, weather information, financial transactions, and civilian infrastructure services to name a few. Over the course of the Conference, three main themes dominated discussions: How does NATO define an attack? What is NATO’s current readiness to respond? and How should NATO prepare for the future? In seeking to address these challenges posed by ‘The Fog of Day Zero’, the JAPCC’s intention was to stimulate debate amongst the various participants. The following proceedings consolidate significant points from the keynote addresses, the panel discussions and attendee contributions to form a summary of the event and to highlight areas for future consideration and development. The document does not record the minutes of the Conference, rather it highlights the major themes and draws together thoughts and ideas from all elements of the conference. For a fuller understanding, readers are encouraged to read these proceedings in conjunction with the previously published Conference Read Ahead material. In the spirit of the Chatham House Rule, no statements, opinions or ideas are attributed to any particular individual within this record.